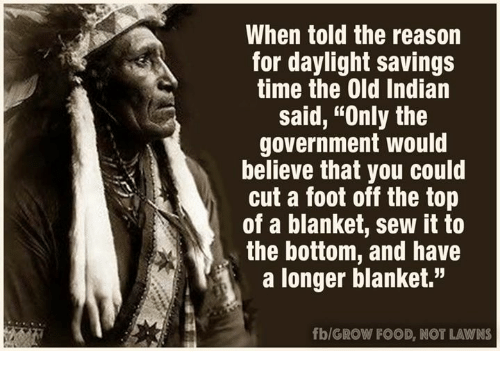 Daylight saving - SILVER PEERS...USE IT or LOSE IT! Clocks on and I don't know if I'm coming or going today. Anyone else.......??? I've been saving all these hours for years. I don't know what to use them for. I might sell them on eBay. Now I know where I've been going wrong! If you sold the hours the day before normal time resumes, you could be sued, because the hours would disappear. I'm glad we don't have it Queensland. I look forward to sunset every day because it cools down. I don't want to be preparing the wifes dinner while it is still stinking hot. Its harder to get the kids to sleep when its hot as well. and i still have my original curtains, - over 20 years old, and have not faded at all, at all. It's a bit like the young boy who had his feet sticking out of the blanket on a freezing night. The boy replied, 'I don't want those cold things in bed with me'. When I was a kid in England during WW2, we had double daylight saving time.